Man has been using leather from the pre-civilisation era. When the human race were only hunters and gatherers. They killed animals for food and used the skin for clothes. The animal hide cannot be used in raw form as it stinks and gets infected by various types of micro-organism. To prevent the same, it is processed by tanning. Depending on the method used the leather may be of various types. The hides for the leather is obtained from different animals, the most common being cow, buffalo, sheep and goat. Other hides used are obtained from skins of deer, camel, snake etc. 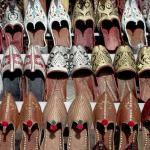 In handicraft industry the leather is converted into various utility and decorative items. Apart from various types of footwear, portfolios and briefcases, shopping and traveling bags, purses and wallets, pouches, belts and jackets are made. Various types of gift items and stuffed animals are also very common.